CAPS United beat Highlanders 1-0 in a Castle Lager Premiership match played at the National Sport Stadium this afternoon. The Green Machine managed to avenge the defeat suffered at Barbourfields two weeks ago. Dominic Chungwa scored the all-important goal in the second half. The first half saw CAPS United creating the better of the chances but action swung from one end to another as both sides looked to take the advantage. In the 41st minute Dominic Chungwa missed a glorious opportunity when Gabriel Nyoni ‘s lost the ball in defence to allow Ronald Pfumbidzai to pass the ball to Chungwa who simply had to place the ball into an empty net but blasted the ball over. 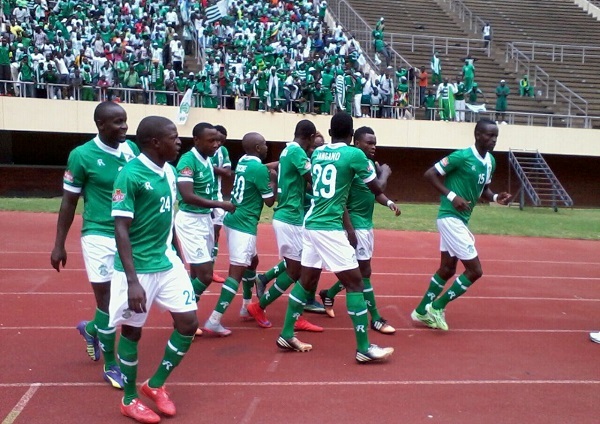 Minutes later CAPS United came close again through Zvirekwi as they pressure mounted for Highlanders just before half-time. In the 58th minute Chungwa made up for his first half miss when he scored following a rebound after a blistering shot from an impressive Tafadzwa Rusike strike was saved by Ariel Sibanda. A minute later CAPS United could have gone two up after a penalty was awarded when Rusike again in the thick of things , won a penalty after Felix Chindungwe handled the ball.Devon Chafa’s spot kick was saved by Ariel Sibanda to keep Highlanders in the game. CAPS United though continued to have the upper hand and Pfumbidzai came very close to adding the second when his shot struck the post. Highlanders rallied for the equaliser and piled the pressure late on causing a number of anxious moments but CAPS United held on to win. 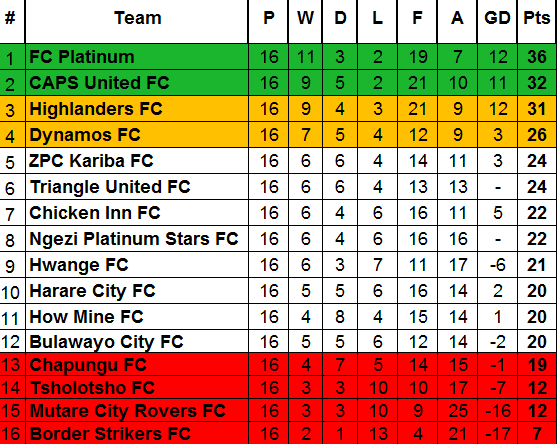 The result saw CAPS United move into second spot four points behind log leaders FC Platinum while Highlanders slip into third with 31 points. In other matches played Hwange and Chicken Inn beat Tsholotsho and Harare City respectively while Triangle and Ngezi Platinum played out a goalless draw at Gibbo Stadium.